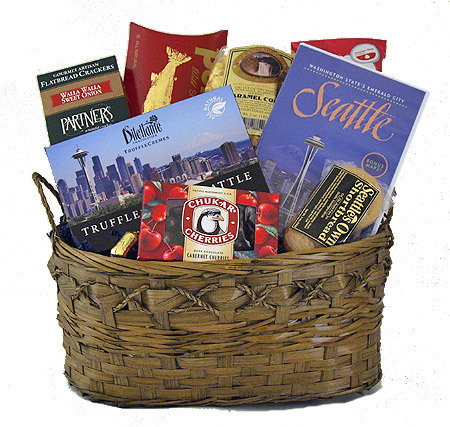 This Seattle Gift Basket is a great way to experience breathtaking Seattle. This scenic 30 minute DVD, "Washington State's Emerald City Seattle" features narration, visual and location maps including the Pike Place Market, Space Needle, The Great Wheel, Seattle Aquarium, Experience Music Project Museum, Century Link Field, Sculpture Park, Sci-Fi Museum at the Seattle Center, Museum of Flight, Underground Tour, Water Tours of Lake Washington & Elliot Bay and downtown Seattle. As they engage in this scenic Seattle overview, they can enjoy Northwest gourmet foods including Portlock's Smoked Salmon Fillet, Partner's Crackers, Dilettane Chocolate Seattle Truffles, Snoqualmie Candy Co. Caramel Corn, Chukar Chocolate Covered Cherries, Seattle's Own Shortbread and Seattle's Best Coffee. A perfect relocation gift, executive gift or business gift to send to recruit or to welcome a new hire!